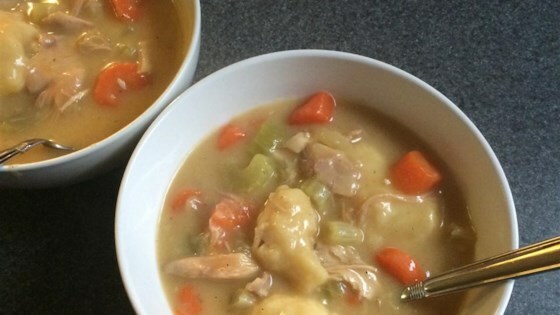 "As a kid I begged my mom to make chicken and dumplings all the time. Now I swear by this simple recipe too!" Whisk together the flour, baking powder, and salt in a mixing bowl. Cut in the shortening with a knife or pastry blender until the mixture resembles fine crumbs. Stir the milk into the flour mixture until moistened. Dough will be pretty lumpy, but be sure to not over mix it! Drop dough by large spoonfuls onto any boiling stew. The dumplings should rest on top of vegetables and meat; it's okay if they stick out of the top a bit. Cook uncovered for 10 minutes; cover and cook another 10 minutes. These were really good dumplings, a bit too fluffy for my liking though, I like them a bit more dense. SOOOOO easy and soooooo tasty. I have always bought the yellow box of biscuit mix to make dumplings. These are far better and the texture is less heavy.